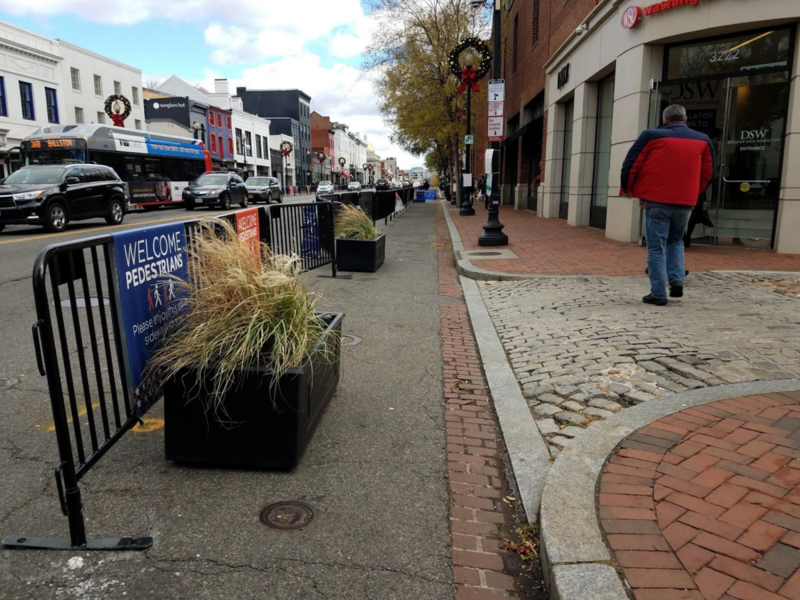 Fences and planters form the temporary sidewalk barrier in Georgetown. Image by Will Handsfield used with permission. Welcome to the “GGWash Sandbox,” a series where we explore visionary, contributor-imagined ideas to make the Washington region greater. These are unofficial ideas that decision-makers have neither studied nor endorsed, so these proposals may or may not actually be feasible for a variety of reasons. As such, we have an expert or two weigh in on what the likely sticking points might be. We hope these ideas spark discussion. For the last three years, the Georgetown Business Improvement District (BID) has implemented a temporary sidewalk widening program on weekends from April through December*. On a few blocks of M Street, curbside parking is temporarily converted into sidewalks, allowing people on foot to navigate the crowded area more easily. Residents and businesses love it, and it’s even improved vehicle travel times along M Street when in effect. The program has been such a hit that it invites the question: what other parts of the city could it work in? The H Street NE Corridor is a great candidate. 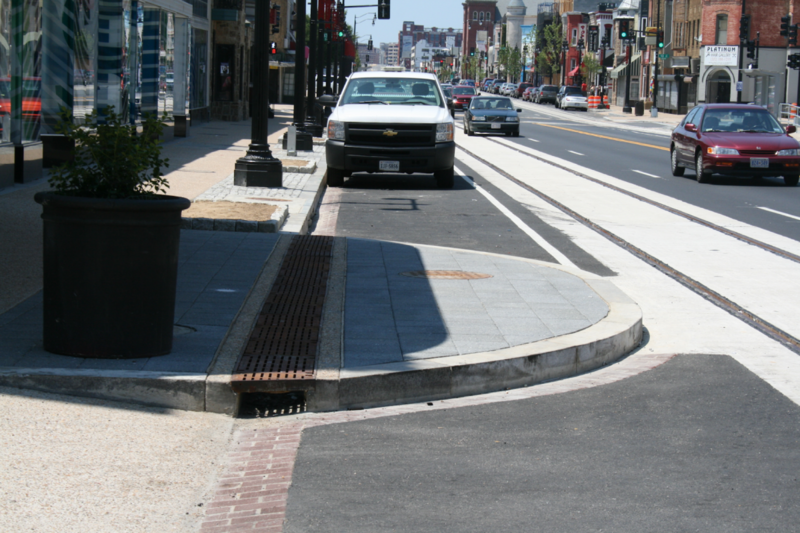 Like M Street, H Street is a busy commercial area whose sidewalks have some narrow, obstacle-laden stretches that make it hard to navigate in crowds, especially with a stroller or wheelchair. Those areas would be first priority for a widening. Where spacious sidewalks already exist, like in front of the Whole Foods, parking spaces could still be used for outdoor seating, parklets, or even some fun urban design gadgets. Curbside parking on H Street contributes to slow speeds and occasional shutdowns on the DC Streetcar. As noted previously on GGWash, the streetcar is slowed not just by illegally-parked cars blocking the tracks, but by cars pulling in and out of parking spaces, and by streetcar operators having to slow down to ensure they don’t hit the parked cars. Having a nice clean pedestrian barrier instead of a constantly fluctuating parking lane would allow the streetcar to cruise along faster. The driving environment on H Street can be chaotic. A lot of honking and dangerous maneuvers can be traced to drivers changing lanes to go around an obstruction — whether it’s a turning vehicle, a stopped streetcar or bus, or a car parking. Removing curbside parking would keep the right travel lane clearer, reducing the need for lane changes that drivers too often don’t execute safely. With a little planning, we could still make it easy to park near H Street on weekends. The H Street Corridor is already one of DDOT’sPerformance Parking Zones which use variable meter pricing, time limits, and resident-only parking zones to manage parking in high-demand areas. By tweaking meter rates within the zone, or perhaps making some free visitor spaces metered, we could manage parking demand such that spaces would always be available on side streets, though likely at a higher price. H Street Corridor Performance Parking Zone. 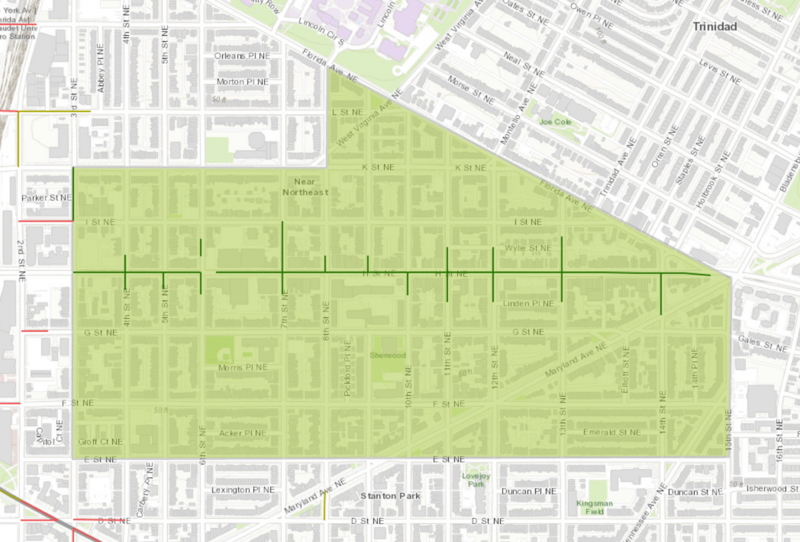 Dark green lines represent metered parking. Image by DDOT. 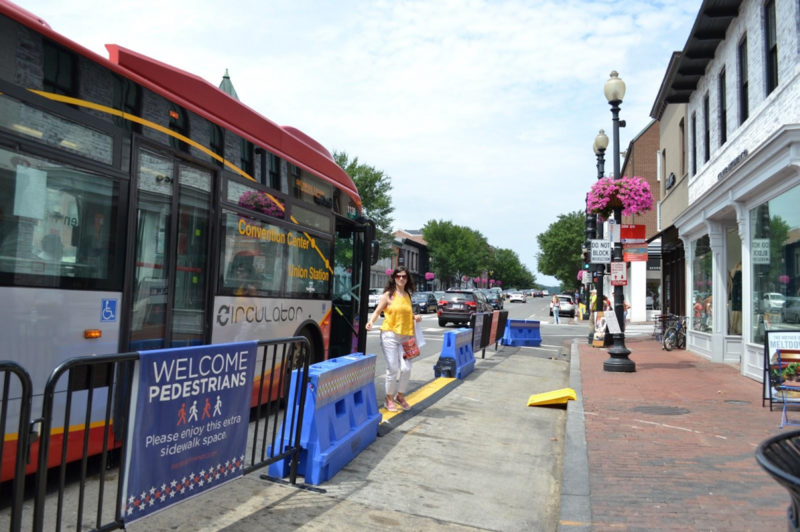 I spoke with Will Handsfield, Georgetown BID’s Transportation Director, to see if there were any challenges or lessons from his experience with Georgetown’s sidewalk widening that might apply to H Street. He mentioned the importance of communicating specifics with the public to build support. In Georgetown’s case, 63 parking spaces were lost for the project, but there was a 740-space garage nearby (with discounted parking available during the event), as well as 2,800 street spaces within a short walk of M Street. Communicating these numbers to the public instead of just saying “we’re taking away parking” probably staved off some potential opposition as people realized how comparatively few spaces were being lost. Sidewalk barrier materials are another consideration. While Georgetown has used water-filled traffic barriers and fences, Handsfield mentioned there are other options, likeremovable bollards that cost a bit more and require installing permanent plugs on the street, but take up less space in storage and offer more security for pedestrians. Another concern is accommodating buses and other vehicles that need curbside access. 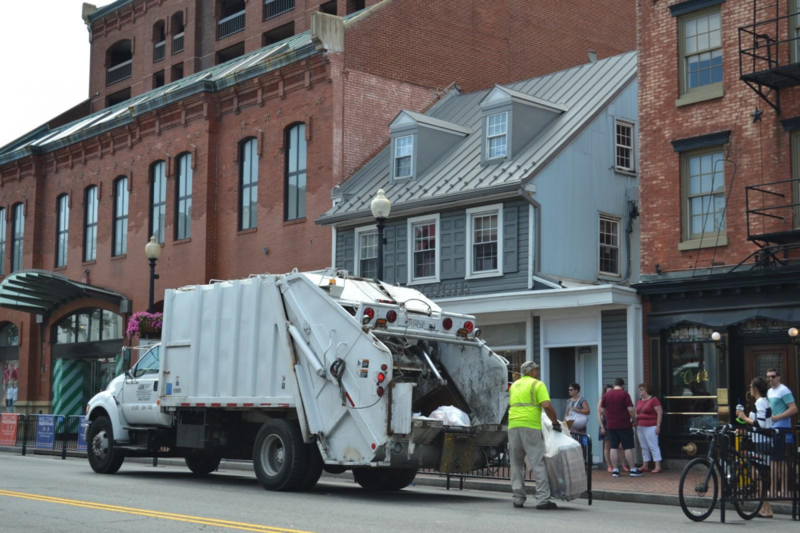 The photos below show how Georgetown does this without interrupting the sidewalk space. Bus loading operations. Image by Will Handsfield, Georgetown BID used with permission. Trash loading operations. Image by Will Handsfield, Georgetown BID used with permission. Handsfield pointed out a few reasons doing a sidewalk widening on H Street might actually be easier than in Georgetown. For one, the H Street area isn’t as space-constrained, which might make it easier to find storage space for the materials when they weren’t being used. Handsfield also mentioned that unlike M Street, H Street has curb extensions at some intersections which add extra protection for the parking lane where the temporary sidewalk would go. Curb extension on H Street NE. Image by Eric Fidler licensed under Creative Commons. Georgetown’s sidewalk widening started small with just a few trial runs on weekends coinciding with large events, then grew into the regular program it is now. H Street could similarly start small, perhaps trying it for one weekend or even just on a few blocks to see if people like it. If Georgetown is any indication, there’s a good chance they will. *The Georgetown program is currently on a pause while they replace water barriers with bollards and put more planters into operation. The BID has an appointment with DDOT’s Public Space Committee in late June which will hopefully lead to the program restarting quickly.